If the face of your outlet has been damaged, dirty or it is just plain ugly, you need to replace it. The main objective is not to get shocked. Make sure you cut the electricity to the box. You shouldn't replace a two-slot receptacle with a three slot unless a ground is available. Be careful about where you place your fingers in the box. First a note about safety: Make SURE that the outlet has no power coming into it. You should purchase a circuit tester and test the outlet before working on it. 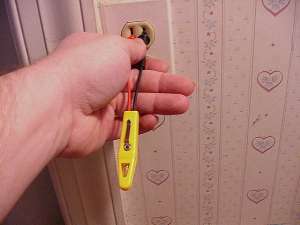 If you are unsure how to do this, check out the Electrical safety howto. Remove the screw holding the cover. Gently pull the cover off the outlet. Watch to make sure that the wallpaper or painted wall board does not come away with the cover. Remove the two screws holding the outlet in place. There is one at the top and one at the bottom. Holding the outlet by the metal "ears" at the top and bottom, gently pull the outlet forward out of the box. Note that there may be two wires or four wires in the box. If there are two wires, your outlet is either at the end of the circuit or the only outlet on the circuit. If there are four wires then your outlet is in the middle of the circuit. Either way is normal.